Here's some very exciting news for the 2015-16 skibike season! 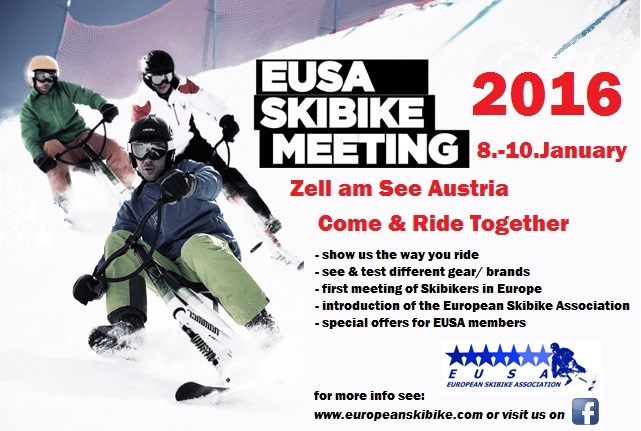 Formed just over a year ago, the European Skibike Association (EUSA) have recently announced their first meeting which will to be held from the 8 - 10 January 2016 at Zell am See in Austria. It will be the first ever meeting in Europe aimed specifically at freestyle skibike riders (skibob riders will still be welcome). Apart from this unique opportunity to socialise and ride with elite freestyle skibikers, you will also be able to test out the latest product offerings from skibike manufacturers. Registration for the EUSA Skibike Meeting is free and you don't even have to be a member to register. Membership costs €25 per year, an amount which you will soon be able to recover using the special price for lift passes and discounts on accommodation available to EUSA members at this event.